Please, the Author for this quote is supposed to be UNKNOWN not TERRY MARK. My brother is my friend, he is my heart, he is my world. He has my heart. We run, we cry, we play, we laugh but at the end of the day he will always be my friend but mosly my big brother and is here to stay. As touching brotherly love ye need not that I write unto you: for ye yourselves are taught of God to love one another. Be kindly affectioned one to another with brotherly love; in honour preferring one another; Not slothful in business; fervent in spirit; serving the Lord; Rejoicing in hope; patient in tribulation; continuing instant in prayer; Distributing to the necessity of saints; given to hospitality. 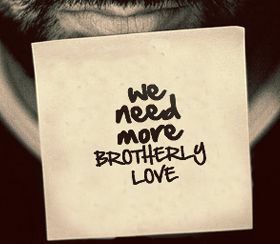 Brotherly love should be established everyday of every month of every year. I love how men still keep their friendships strong, while most women neglect theirs as soon as a man comes around...brotherly love. You know that you know the true meaning of sacrificial brotherly love when you let someone else be your favorite character in Smash Brothers. We are not only our brother's keeper; in countless large and small ways, we are our brother's maker. Every male or female can have another sibling who is of male gender and is born of the same parents. Biologically, that person is referred to as a brother. In fact, brother is someone with whom one is associated by some circumstances of birth. Brothers are great source of support and strength and one can share some of our most secret information with our brothers, hoping that they won’t spill the beans.